Fabio Paglieri, Luca Tummolini, Rino Falcone, and Maria Miceli, eds. Cristiano Castelfranchi is one of the pioneers in the theory of goals and goal-directed behavior. His first seminal contributions date back to the 70s, and his work has provided invaluable insights on a variety of topics, such as the nature and functions of mental representations, the dynamics of belief and reasoning, the anatomy of emotions and motivations, power and dependence relationships, trust and delegation, communication, norms, organizations, institutions, and agent-based social simulation. Across all these areas, Castelfranchi�s approach has been systematically problem-oriented and markedly interdisciplinary, achieving worldwide prominence in such diverse domains as cognitive psychology, social science, Artificial Intelligence, and philosophy of mind. What gave consistency and order to his bold and broad theorizing of the human mind and society is the view that, as he puts it in this volume, goals are the true center of cognition. This collection of essays to honor Castelfranchi�s outstanding career reflects both his wide interests and their unifying focus. Over sixty leading scholars in their respective fields offer comments, elaborations, extensions, and cogent criticisms of Castelfranchi�s ideas, exploring their implications and often uncovering unexpected connections with other theories. 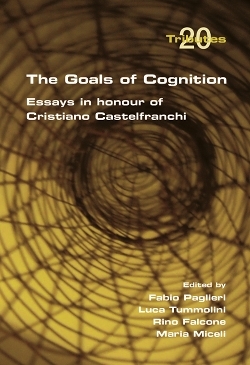 This collection is then completed by a survey of decades of research on the theory of goals, authored by Castelfranchi himself. Thus the volume provides not only a fitting homage to Cristiano Castelfranchi, but also an invaluable reference to anyone interested in goal-directed behavior, at both the individual and the social level.